Jungle Surfing is a unique and exhilarating way to experience the beauty of the world-renowned Daintree Rainforest. Surf from platform to platform with this award winning experience! Jungle Surfing Canopy Tour is a unique and exhilarating way to experience the beauty of the world-renowned Daintree Rainforest. Fly through the trees of a series of flying fox ziplines stopping at 5 platforms along the way! The rainforest has more strata than any other terrestrial ecosystem, and can only be truly appreciated by getting up into the canopy. 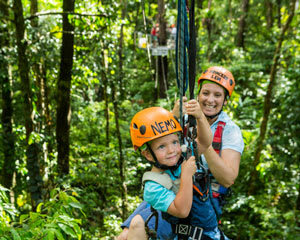 The tour offers unparalleled access to the heart of the Daintree Rainforest from the bustling forest floor to the giants that tower above the canopy. For some it can be a little scary to leave the ground behind, but the expert guides accompany you every step of the way controlling all equipment and flight so there's no experience or tuition necessary. But it’s not just about the ziplining, the guides will tell the fascinating story of the world's oldest rainforest. The team want you to have fun, feel the excitement that they feel every day as you fly through the trees, rediscovering your sense of adventure, and taking away a new understanding and appreciation of the vibrant and intricate life of the rainforest. The platforms range in height from 7-16m above the ground and showcase every level of the rainforest canopy. The ziplines range from 37-95m and are travelled in pairs except for one solo flight across a rainforest creek - upside down if you dare! The final span to the ground features side-by-side racing ziplines with speeds over 45km/h! On arrival at the harnessing centre, you’ll meet your team of guides who’ll be taking you surfing through the jungle. Each guest will be fitted into a full body harness and helmet. A 350m walk through the forest leads to the Departure Lounge, where you’ll be given a safety briefing before leaving the forest floor and are hoisted up to platform 1 by our very own Human Hamster Wheel Cable Lift. From Platform 1 – 4, you will travel in pairs a few metres apart. The guides completely control your gentle flight, leaving you free to take photographs or just take in the stunning views. Midway between Platforms 3 and 4, you’ll stop briefly at the highest point of the tour, 23 metres above Mason Creek. If you’re lucky, and visit during wet season, this creek will be a raging torrent of white water. From Platform 4 to 5, in a beautiful section of old-growth rainforest, you’ll fly solo and fast back across the creek. Don’t forget to give us your best Tarzan cry! Platform 5 to 6 is an opportunity for thrill seekers to try something different, and if you choose to do so, you can flip yourself upside down and watch the ground beneath you speed past. The final zipline on Platform 6 is your chance to have a race and go fast if you'd like. You're paired up on separate ziplines as the guides let you speed down to the bottom of the course. Then you have short walk back to the harnessing centre where you'll be taken back to the Jungle Adventure Centre to view your photos and then on to your Cape Tribulation accommodation if you’re staying in the local area. The tour itself takes around 2 hours from pick-up to drop off, and you’ll spend around 1 hour up in the trees, with plenty of time on each platform to experience the rainforest environment. Children under 12 years of age must be accompanied by an adult. Children between 12 and 17 years may Jungle Surf unaccompanied. However, all persons under 18 must have our Medical Declaration & Waiver Release signed by a parent or guardian prior to the tour. Jungle Surfing is not recommended for pregnant women. Felt the whole arrangement, presentation, operation, personnel, execution of the Jungle Surfing Canopy Tour was first rate. Staff was helpful, informative, knowledgeable, concerned, engaging and humorous. Will definitely recommend it to others and do it again when back in Australia. If I have any recommendation it would be to cut the photo prices by one-half - sales would double. All in all, a wonderful experience. This was a great value for the money. Fun, safe, great staff, knowledgeable and attentive to the visitors. Great for everyone! Jungle Surfing should not be missed. Staff ensured the safety of everyone and were knowledgeable about the environment. It was great fun. Awesome experience. Very friendly, knowledgable and safety conscious guides and staff. Great views from all platforms. Highly recommended. Had a small amount of difficulty cancelling two of our six adventures due to car breakdown but eventually Adrenalin staff sent through a credit voucher for later use. Thankyou. The guys at jungle surfing we're funny and helpful would highly recommend .